Alex Vella Gregory discusses the summer edition of KantaKantun for SkolaSajf. Read on to find out more. Words by Alex Vella Gregory. A drawing of a skeleton by the Rabat group. Maltese summers can be unforgiving. The hot humid air can bring the best of us down, and thus it was with some trepidation that we launched into a summer edition of KantaKantun for SkolaSajf. This project brings together music and architecture, and encourages students to observe, comment and create. SkolaSajf is a government-run educational summer camp. It focuses on education through activities and games. So the aim was to tailor KantaKantun as a suitable project over a shorter time span and work with two more schools. 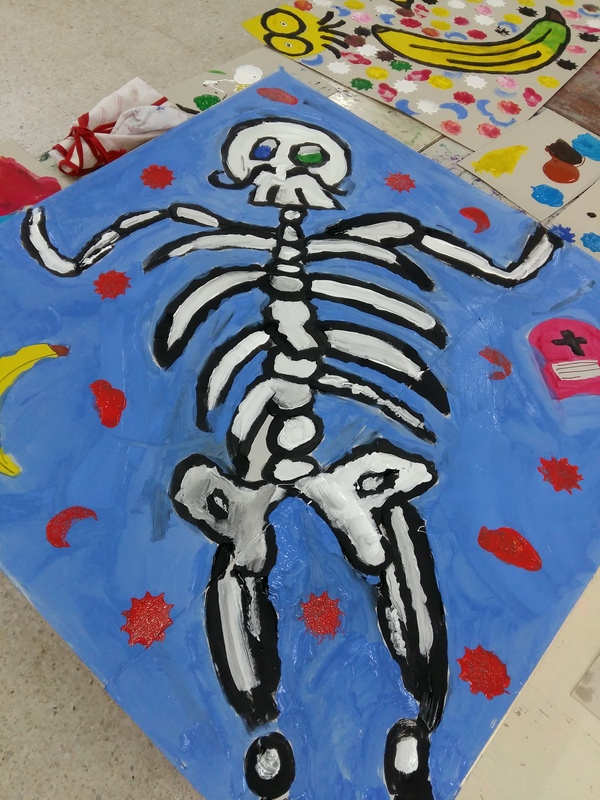 This time round, we worked with Birżebbuġa and Rabat Primary School, two very different localities with students who had very different outlooks on their surroundings. The project was spread over three weeks. The first week was dedicated to exploring ideas of architecture and music as separate disciplines. Together we talked about what we understand by architecture, and ultimately it boiled down to use of space. Similarly, we looked at how music is constructed, and we discussed key elements such as melody and rhythm. The second part of the project brought together the two disciplines. Each school was taken out for a short trip around their respective locality. The students were each given a map with an itinerary that highlighted some important architectural features. In each case, the trip had a different flavour. In Rabat we looked at not only historic buildings, but also vernacular architecture, archaeological remains and postwar buildings. In Birżebbuġa the artificially created Pretty Bay was an obvious point of reference, but we also discovered a 16th century fortified dwelling and a postwar abandoned cinema. Upon returning to the school, the students worked on using voice and percussion instruments to create different sounds. With that in mind, the students worked in groups and chose a favourite stop on the morning’s route. They then chose suitable sounds with which they could render their favourite locations. The Rabat students were visibly fascinated by the historical aspect of their town, and there was a lot of haunting going on in their soundscape! On the other hand, the Birżebbuġa students focused more on the jolly festive atmosphere at the beach, although the abandoned cinema did elicit some scary otherworldly sounds! In the third and final parts, the two schools swapped their recorded soundtracks. This time round they had to come up with drawings and designs based on what they heard on the recordings. Things got very creative and we had drawings of haunted castles, frolicking minions, and even a Sphinx pastizzeria! The KantaKantun team then took these designs and quickly transferred them onto a series of giant cubes, not unlike building blocks, and the students then painted these structures in bright colours. These were then displayed in an appropriate space within the school premises for all to enjoy! 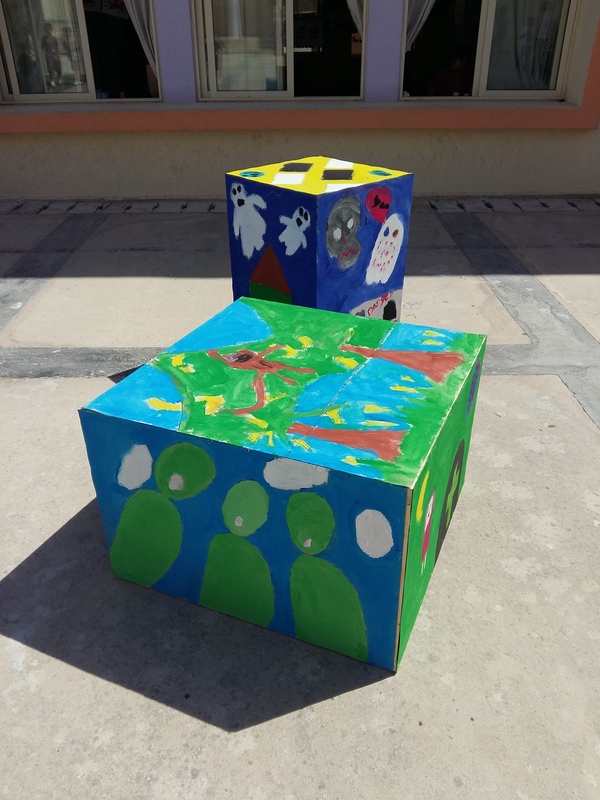 Painted cubes by the Birżebbuġa group. I would like to take this opportunity to thank once more Charlo Briguglio, Junior Architect and collaborator on this project, as well as our invaluable assistants Samuel Mallia and Glen Montanaro. I would also like to thank the administration and staff of both Rabat and Birżebbuġa Primary schools for their support, as well as the SkolaSajf administration. And last but not least, a huge thank you to the students whose enthusiasm and creativity made us all forget the sweltering summer heat!